If you think if such a topic is needed to be published, you would be surprised to know that this post is a treasure trove of knowledge. A lot of research went behind this post. So if you think that this is a silly post, you may be wrong because belly button is where life begins. Senthil made the remarkable statement "Information is wealth" to Kicha and that one statement is the driving force behind this public post. I have the habit of lying down on the couch and scratching my tummy at home. Scratching my tummy gives me a great sense of satisfaction. I bet all of you agree with me on this. Those who have pot bellies have more area to scratch. Last night when I was scratching my tummy, my finger became tired and I decided to park my finger in my belly button.
" Abaayagaramaana bhoomikku Aandavan itta mutru pulli - thoppul" which in English translates to " The belly button is the full-stop made by God to a dangerous plain"
He wrote that piece of crap while he was drunk. But he thought that he had written a great romantic love letter. He went ahead and gave that letter to the girl he loved and proposed to her. We all thought that she would slap him. But she said "Yes". Now they are married. I don't understand how on earth that piece of writing qualifies for a love letter! I digressed from the main subject. My thought process about belly buttons made me to perform a google search to understand if there are different types of belly buttons. Google did not disappoint me. 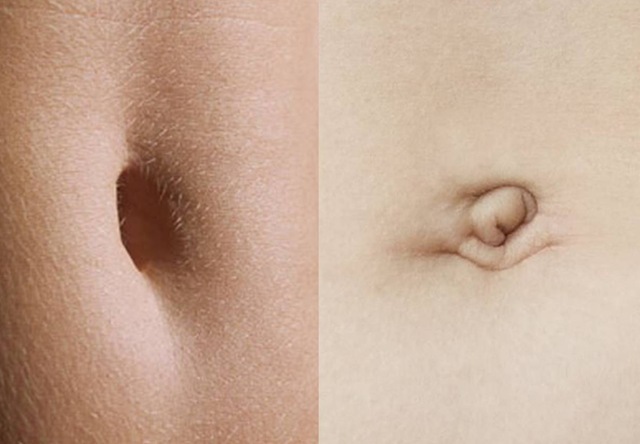 After 35 years of existence, I realized that the belly button is classified into two types. 90% of the people in the world have an Innie belly button and the remaining 10% of the people have an outie. I seriously have no idea who did that research to come up with that percentage. I am of course an innie because I could park my finger in my belly button. Those who have an outie belly button find it easy to have body piercings. That led me to the search on who was the first person to have their belly button pierced. Some people have done their PhD thesis on this topic. Though body piercing stories date back to the BC era, it was Christy Turlington who made headline news when she showed her pierced belly button in a fashion show in London. If you do not know who she is, scroll up. She is the one in the opening image of this post. Tamil film Industry has made optimum use of belly buttons. P. Vasu is a director who should have been a participant in Master Chef Australia. He made Prabhu Deva to cook an omelette in Nagma's belly button in one of his movies. But many years before Prabhu Deva cooked an omelette, Captain Vijayakanth spun a top in Suganya's belly button in the movie Chinna Gaunder. That movie was released in the year 1992. That was the same year in which India did not even win a single medal at the Barcelona Olympics. If only spinning tops on belly buttons had been included as an Olympic sport, Captain Vijayakanth would have won a gold for us and made us all proud. All of us know that belly button is where life begins, It also serves as the food pipe for human beings when they are inside the tummy of their mummy. All of us have performed bungee jumping inside the tummy thanks to this belly button. Pregnancy can make an innie an outie and vice versa. So for a woman, the belly buttons might change their type after childbirth. Belly button has an alternative name called navel. I don't know why one has to give that ugly name to belly button. I had a classmate named Navel Sharma. She was so ashamed of her name that she would address herself as Miss Sharma. She married a naval officer. The Bellybutton is nothing but a small dent in the belly of a person and it even gathers dirt and bacteria, just like how hair strands automatically accumulate in bathroom water outlet. Why are people so obsessed with the belly button? Supermodel Karolina Kurkova does not have a belly button. Apparently, her belly button was removed during an operation she had in infancy. You can please check your belly button now and if you have a belly button, you can be assured that you are not Karolina. The famous filmmaker Alfred Hitchcock also lost his belly button But it's not clear whether the rumours are true. We can't dig his grave now in search of the missing belly button. There is a soul lying deep inside the grave without her two legs. Fantastic. Couldn't stop laughing. Informative though. Good one!